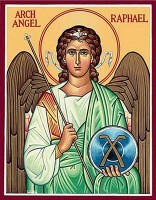 St. Raphael is one of seven Archangels who stand before the throne of the Lord. He was sent by God to help Tobit, Tobiah and Sarah. At the time, Tobit was blind and Tobiah’s betrothed, Sarah, had had seven bridegrooms perish on the night of their weddings. Raphael accompanied Tobiah into Media disguised as a man named Azariah. Raphael helped him through his difficulties and taught him how to safely enter marriage with Sarah. Tobiah said that Raphael caused him to have his wife and that he gave joy to Sarah’s parents for driving out the evil spirit in her. He also gave Raphael credit for his father’s seeing the light of heaven and for receiving all good things through his intercession. Besides Raphael, Michael and Gabriel are the only Archangels mentioned by name in the bible. Raphael’s name means “God heals.” This identity came about because of the biblical story which claims that he “healed” the earth when it was defiled by the sins of the fallen angels in the apocryphal book of Enoch. Raphael is also identified as the angel who moved the waters of the healing sheep pool. He is also the patron of the blind, of happy meetings, of nurses, of physicians and of travelers. His feast day is celebrated on September 29th. Blessed Saint Raphael, Archangel, We beseech thee to help us in all our needs and trials of this life, as thou, through the power of God, didst restore sight and give guidance to young Tobit. We humbly seek thine aid and intercession, that our souls may be healed, our bodies protected from all ills, and that through divine grace we may be made fit to dwell in the eternal Glory of God in heaven.